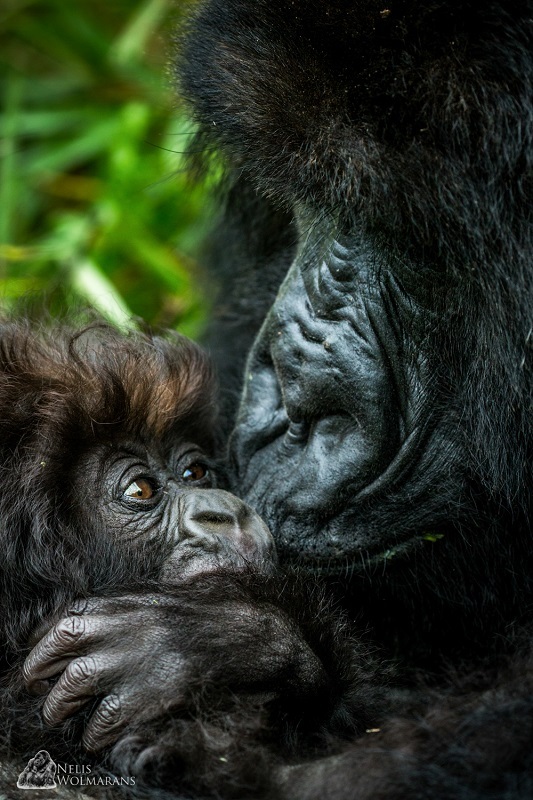 At 5:15am a gentle knock on the cottage door announced the start of a very exciting day for both my client and myself, our first long awaited Mountain Gorilla trek has finally arrived. Although I have trekked these great apes numerous times before, the excitement is ever present. A real treat is sharing in the overwhelming emotions of first-time trekkers, an apparent mixture of childlike excitement, a subtle dose of nerves and of course, the “we are finally here and it is happening” look of appreciation. It is this kind of excitement from clients that makes it impossible for us as guides to take what we do for granted and makes us appreciate the privileged position we are in. 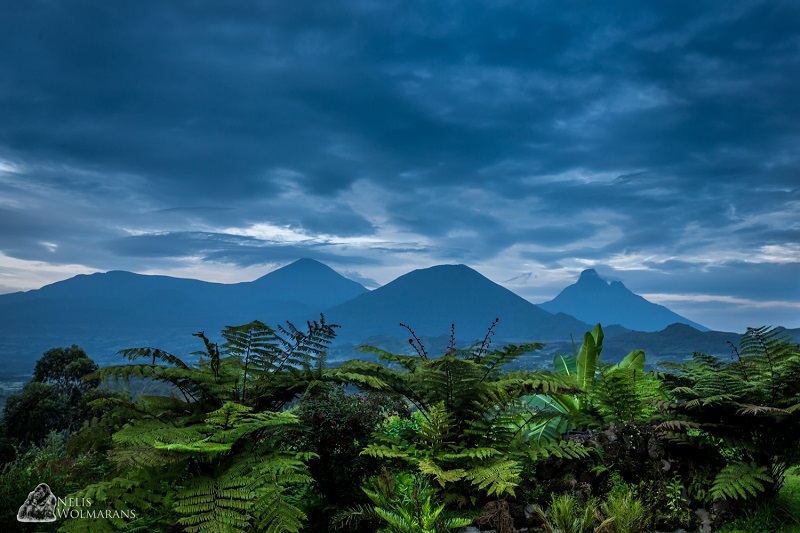 From the lodge veranda, we were greeted with a beautiful view of the volcanoes and the lush green forests of the Virunga Volcanoes. 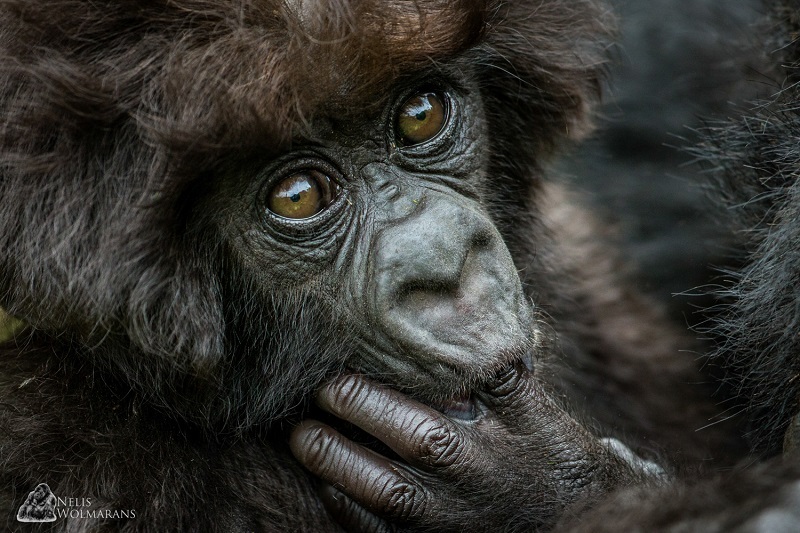 The cloud cover promised us the best possible lighting conditions in which to photograph these spectacular primates. Following our 6am breakfast, we transferred a short distance to the Volcanoes National Park headquarters where we met our guide and received our pre-trek briefing. A short drive took us to the starting point of our trek. From here, we will cross the neatly cultivated farms and make our way to the park boundary where we would enter the forest through a small gap in the stone wall. Escorted by an armed guard, because the park is also home to Buffalo and Elephant, and our park guide, we followed a muddy trail through an enchanting bamboo forest. As we ascended, the bamboo forest eventually gave way to a mixture of shorter types of vegetation that covered the forest floor and for the most part was shadowed by gigantic Hagenia trees that were draped in moss and vines. About one hour into our trek we could hear the welcoming sound of a Mountain Gorilla’s chest beat. This sound echoes through the forest and can be heard at up to two kilometers on a clear day. 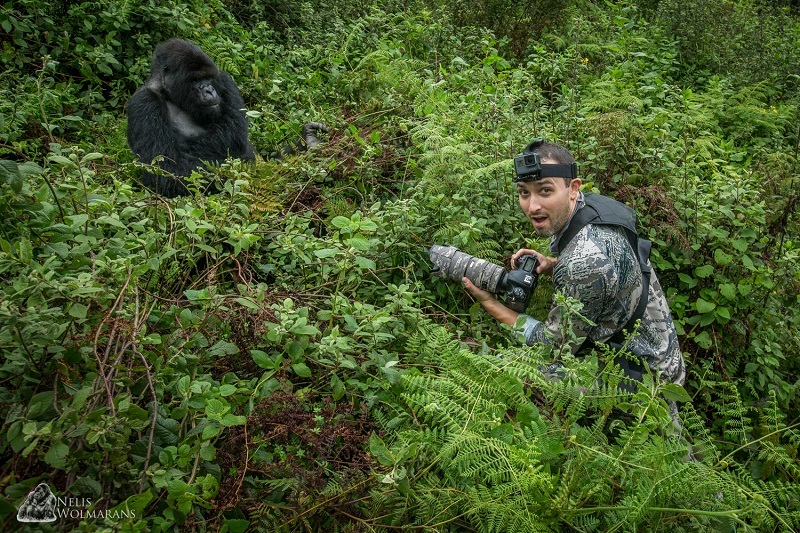 Roughly thirty minutes later we met up with the trackers, a team of armed guards that follow each of the gorilla families during all daylight hours. Funds generated through tourist dollars not only supports these men and women in doing their highly valued jobs, but also supports the local communities who not only benefit from selling their curios and fresh produce to the tourist lodges, but they also receive a portion of the fee paid towards each gorilla trekking permit, a win-win situation for all, the precious wildlife within the park and the communities that surround it. 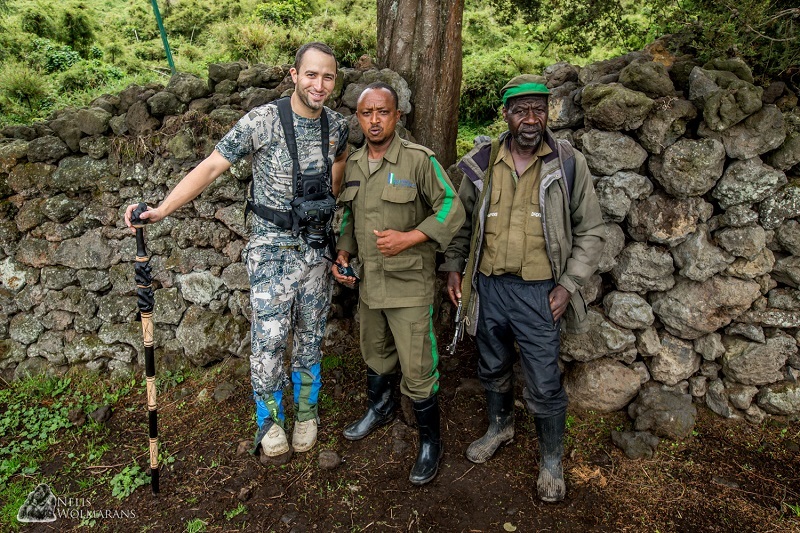 We left behind our backpacks, walking sticks and our porters, who assisted us in getting our gear to this point. This is another initiative from which the local communities benefit from tourism. 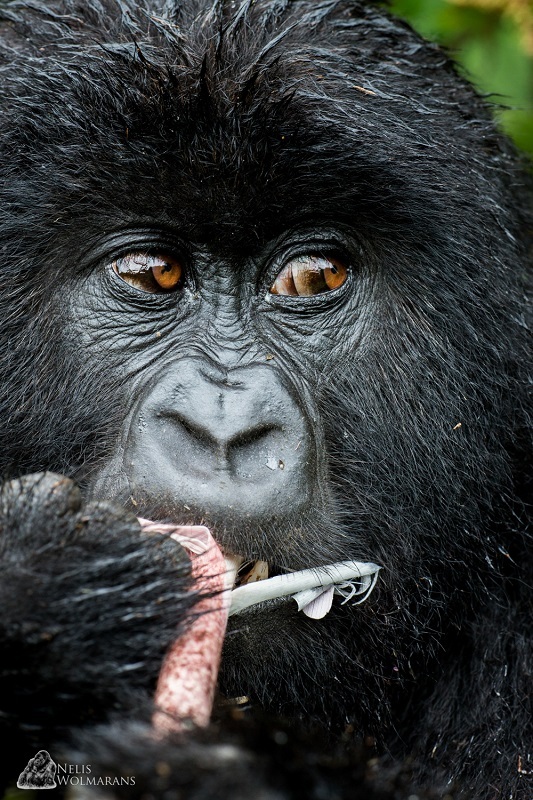 A quick sip of water and off we went to meet the “Gentle Giants of the Virunga”. Our first interaction was with a very young individual who could not have cared less about our visit, he just sat back enjoying his breakfast. From here our attention was drawn to one of the two young Silverbacks that lead this family, who was equally unperturbed by our presence. 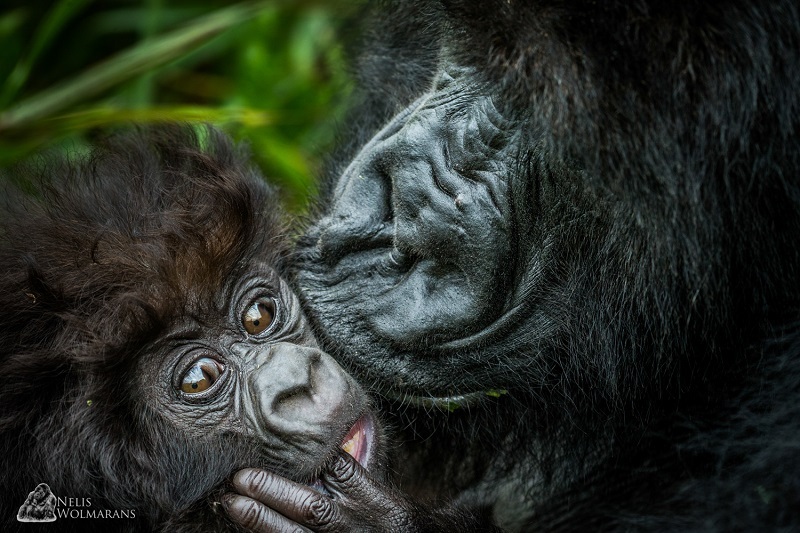 All visits to the gorillas are limited to strictly one hour and ours was finished off with a very special moment shared between a very caring mother and her tiny infant. What a privilege it was to witness this kind of interaction, let alone photograph it! 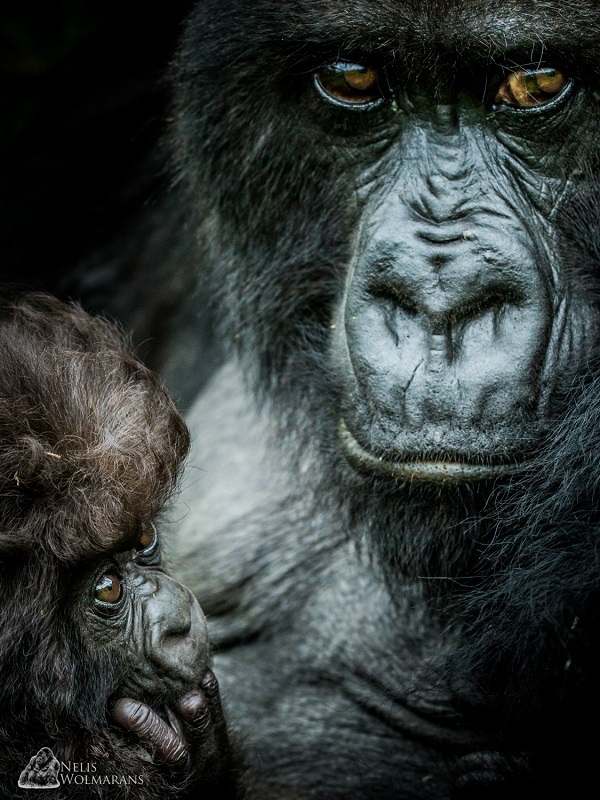 It was impossible not to get caught up in the interaction between this mother and child. It was as if she was in absolute awe of the little bundle of fur that clung onto her. The perfect end to a fantastic experience.